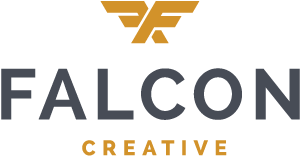 Falcon Creative is a digital marketing company focusing on helping businesses of all sizes elevate the quality, efficiency and lead conversion of their marketing and advertising efforts. Our team is made up of industry professionals with loads of advertising, marketing and consulting experience. In our varied careers, we've worked with all sorts of businesses – from Fortune 500 companies to small "mom & pop" shops. Let our knowledge and expertise work for you. Heather is the leader and co-founder of Falcon Creative. She has over 15 years of sales and marketing experience and owns 2 businesses. She is highly-ranked in her field and is nationally recognized. Scott is the co-founder and award winning creative mind behind Falcon Creative. He has over 20 years of graphic design experience, working in a variety of industries – primarily advertising. We like good, solid design that drives engagement rates. Everything we create has over 20 years of strategic experience built in. It is the heart of what we do. We’ll work with you to build a data-driven strategy that ensures your customers are always coming back for more. If you build it, they will come. We’ve been in meetings about hipster cats, evangelized about the need to test your message and worked with a number of engagement tool providers to enhance their toolsets. We get digital marketing. At Falcon Creative, we are partners in your success. We don’t just tell you what to do, we work with you to do it and explain to you why we’re doing it that way. Every campaign we build is data-driven and agile. 1Our team will work with you to assess your needs and where you are in your business. Once we know where you are, we can lead you the rest of the way. 2 Our team will partner with you to build a robust, data-driven marketing program that will get you the results you need to conquer your market. 3 We promise we will never try to sell you something you don't need. We are committed to creating the best program possible for every single one of our clients.